It has hand like claws on each leaf and spines. Since its moved outside the leaves are curling toward center of plant. Growth pattern is mirrored, like gasteria . Although Gasteria and Aloe are in different genuses in the same species, they do hybridize and I'm thinking this could be one of the results. The characteristics of the toothed edges of Aloe, but the fan shaped growth of Gasteria indicate this. 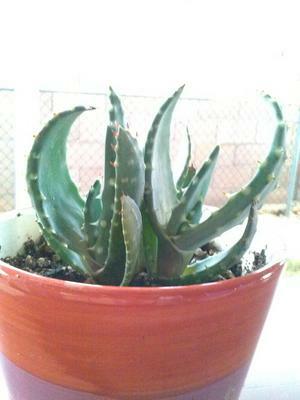 These generic hybrids are indicated by using an x in front of the clumped together name, like this; x Gasteraloe. Only those plants that are parented by two genera are given this to differentiate it from a hybrid that is from two species. For care, they are really tough plants and have hybrid vigor; about the only thing that can kill them is over watering. It will be interesting to see what happens if and when it blooms, as the flowers on each of the parents are different. How much light can it handle? When it was inside on the windowsill, the leaves flattened out. When I put it outside they got a dramatic curve. I wasn't sure if was due to too much light or heat (I'm in Arizona), or just natural to the plant. I know the parent plants probably had opposite light needs. Any suggestions? I would think that these hybrids would need fairly bright light, because both of the parents like it bright. I would like to see pictures, if you have them. You can put them on the Ask the Horticulturist page.